Its All About Satellites will be exhibiting at the Nebraska Nursing Facility/Nebraska Assisted Living Association Spring Convention and Trade Show at the Younes Conference Center in Kearney, NE on April 21st. We will be providing information for nursing homes and assisted living facilities on lowering your costs for providing television programming for your residents while increasing the number of channels, the quality and functionality of the system you install. We design and install two HD TV systems that are a revolutionary change in providing TV for Healthcare, Assisted Living and Long-term Care residents. Each system has unique benefits for your facility. 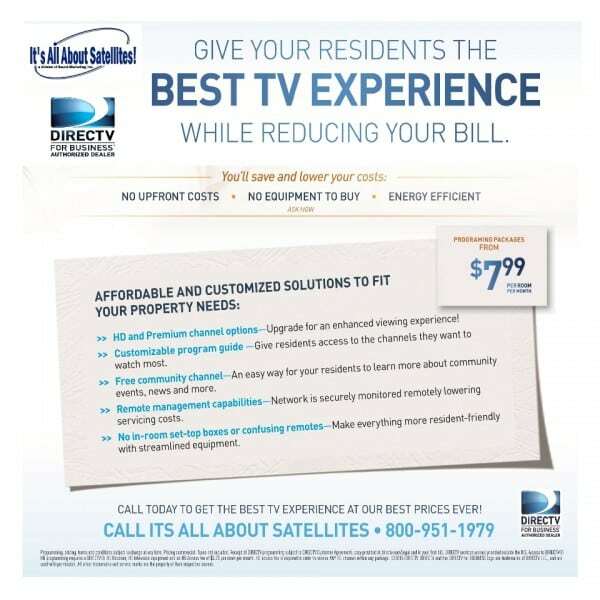 The DIRECTV Residential Experience (DRE) is groundbreaking, advanced hospitality technology. Unlike other TV systems designed for healthcare, assisted living, and long-term care facilities, the DRE is is now available to facilities with all types of wiring schemes (home-run or loop-thru/daisy chain). Your residents will benefit from access to hundreds of HD channels and exclusive sports programming, like NFL SUNDAY TICKET plus the remote and user-friendly interactive program guide they are used to at home. Facilities utilizing the DRE will benefit from happier residents, PMS integration and now the new DIRECTV Welcome Screen system. 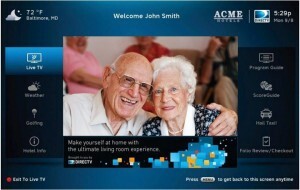 Unlike cable and other TV systems, the DIRECTV Residential Experience‘s advanced technology solution lays the foundation for a more robust, interactive resident experience without the additional, and often costly, hardware requirements. 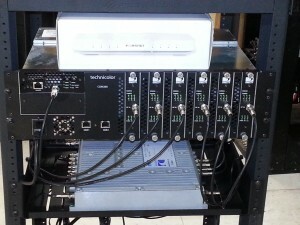 When it was introduced in 2009 the COM1000 HD Pro:idiom headend system was a revolution in HD TV Systems. The COM2000 headend TV system brings many of the best features of the COM1000 into a new 25% smaller (3RU) and more energy efficient HD headend system (just 225W of power consumption) while maintaining the nearly plug and play platform. This new system is super-stable and full-featured right out of the box. With over 100 member facilities, the Nebraska Nursing Facility/Nebraska Assisted Living Associations are nonprofit trade associations representing long-term health care facilities in Nebraska.